A copper-alloy casting sprue of uncertain date. It is circular in shape with a conical profile and slightly concave flat front face. From the back of the sprue extends a sub-triangular prong, a second corresponding prong now missing due to old breaks. The entire object measures 22.37mm in height, 20.52mm in diameter, and weighs 25.02g. This is a sprue resultant from the casting of copper-alloy. 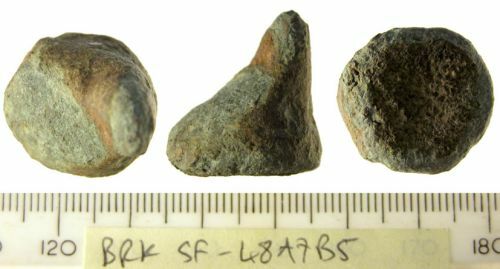 It is of uncertain date ranging from the Bronze Age through to Post-Medieval periods, although finds from the same site may indicate a possible Roman date.